Cats have a reputation for being low-maintenance pets. And, in many ways they are. But cats are also good at hiding illness or pain and even the most doting cat parent can miss signs that there’s a problem so it’s important to visit your vet regularly. (Learn seven subtle signs your cat may be sick.) 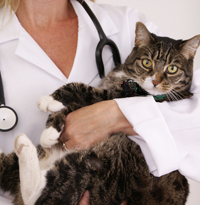 In fact, this week is Take Your Cat to the Vet Week so there is no better time than now to schedule your appointment. I take my boys Romeo and Pugsley in once a year for routine check ups, but we are there a lot more often than that. I’m the type of cat mama who thinks any unusual behavior is a sign of something more serious so — much to my boys’ chagrin — we’re at the vet every few months. 56% of respondents said their cats “vanish” when the cat carrier comes out. 25% answered that their cats just gave them the “stink eye” but allow their owners to put them in the carrier. And, a lucky 8% of cat owners have cats that just hop right on in the carrier. Ironically, 76% of people who answered said once they’re at the vet, their cat does not want to get out of the carrier! I guess they figure it’s the lesser of two evils at that point! 54% of respondents said their cat “yeowls” the entire way to the vet. Another 38% said their cat simply meows during the trip. 48% of cats are called “handsome” by the vet staff. Other cats are called: beautiful, baby, lover boy, sweet thing, buddy and some — not surprisingly — demon cat. Tell us: Do you have a funny vet story? Tell us below! Caroline Golon is “staff” to two rascally Persian cats, Romeo and Pugsley. Read more about Caroline’s life with cats at www.romeothecat.com and www.thehappylitterbox.com.